COMPANY PROFILE General Mills Inc is a global manufacturer and marketer of branded consumer foods, such as ready-to-eat breakfast cereals, refrigerated dough and other baking items, snack foods, ice cream, and yogurt. General Mills manufactures branded consumer foods, like ready-to-eat cereals, convenient meals, snacks, yogurt, baking mixes, and ice cream, to retail and food-service customers. Its key brands include Cheerios, Betty Crocker, Haagen-Dazs, Pillsbury, Nature Valley, Old El Paso, Annie’s, and Yoplait. The North America retail segment contributed roughly two thirds of sales and three fourths of operating profits in fiscal 2017. More than 70% of General Mills’ revenue is generated in the United States. The firm is poised to bolster its presence in the natural and organics aisle with its pending acquisition of Blue Buffalo, a natural pet food brand. 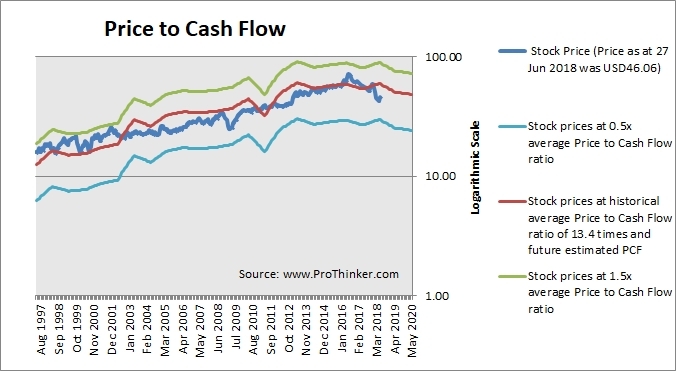 When a company’s cash flow growth rate slows down, it will not command the same Price to Cash Flows ratios as before and they will have to be adjusted downwards. 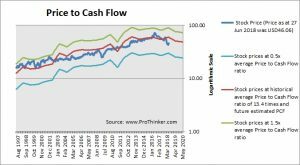 At the price of USD46.06 as at 27 Jun 2018, General Mills Inc is trading at a Price to Cash Flow Ratio of 10.5 times last 12 months cash flow. This is a 22.0% discount to its historical average Price to Cash Flow Ratio of 12.2 times.